string(1356) "Resource Centre > Uncategorized > 18th Alliance against Trafficking calls for broad, inclusive, multi-disciplinary and multi-agency approach based on strong partnerships"
Vienna, 24 April 2018 – OSCE Special Representative and Co-ordinator for Combating Trafficking in Human Beings Madina Jarbussynova urged today OSCE participating States to capitalize on the best practices and many successful multi-disciplinary and multi-agency programmes at local and national levels highlighted at this year’s conference. The two-day high-level conference entitled Everyone has a Role: How to make a Difference Together focused on promoting the importance of inclusive partnerships, including with non-traditional actors such as medical practitioners, teachers, financial investigators, businesses, municipalities, the media and religious organizations, whose engagement could bring added value to the anti-trafficking response. “The fight against slavery entails working together and combining forces” said Chief Executive Officer of the Thomson Reuters Foundation, Monique Villa, during her keynote address. “Prosecutors, governments, law enforcement, lawyers, NGOs on the ground and – of course – survivors must co-ordinate better. To build these partnerships, we need the full participation of organizations such as the OSCE and this year’s Alliance gathering was clearly a step in the right direction in this regard”. “Through its extensive field presence, the OSCE can bridge the legitimate interest of States to secure their borders and the protection of fundamental rights, while facilitating the engagement of civil society and non-governmental organizations which often see the emergence of the phenomenon even more rapidly than state institutions” said Italian Undersecretary of State for Foreign Affairs and International Cooperation, Vincenzo Amendola. “The OSCE is best placed to address the complex and cross-dimensional nature of this crime”. Further opening remarks were provided by several high-level speakers, including Director of the OSCE Office of the Secretary General, Paul Bekkers, Director of the OSCE Office for Democratic Institutions and Human Rights, Ingibjörg Sólrún Gísladóttir, Director of UNODC’s Division for Treaty Affairs, John Brandolino, UNICEF’s Regional Director for Europe and Central Asia, Afshan Khan and UNHCR’s Special Envoy for the Central Mediterranean Route, Vincent Cochetel. 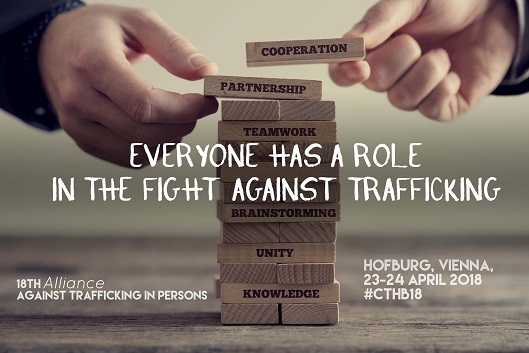 “Many official speeches about defeating the business model of those trafficking human beings tend to ignore the needs of the victims” cautioned Special Envoy Cochetel. “A comprehensive response just requires more transnational policing and judicial co-operation, as if it were terrorism, arms or drugs”. A video address from Deputy Executive Director of UN Women, Yannick Glemarec, provided a timely reminder that if the 2030 Agenda for Sustainable Development and its 17 Sustainable Development Goals (SDGs) are to be met, considerably more work will have to be undertaken by a broader range of actors. Speakers at the conference agreed that an inclusive approach is critical to address complex transnational trafficking rings. Some of the expert debates focused on how the travel industry could be better engaged in preventing trafficking in human beings; the critical need to involve civil society in broad anti-trafficking partnerships; the specific needs of unaccompanied foreign minors, along with best practices which exist to ensure their protection and successful rehabilitation; the value of the media and the challenges faced by journalists in shedding light on trafficking. A comprehensive report detailing concrete recommendations will be published by the OSCE in the coming month. The event was attended by 351 participants from across the 57 OSCE participating States and 11 Partners for Co-operation, including representatives of major international organizations, NGOs, academia, civil society, trade unions, think-tanks and the media, all interested in improving responses to all aspects of trafficking in human beings. 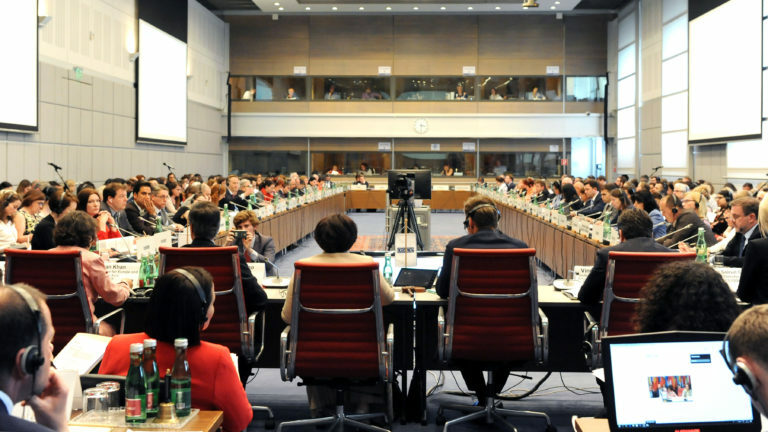 Fifteen years since the adoption of the OSCE Action Plan to Combat Trafficking in Human Beings, the Alliance conference continues to address new and emerging trends of human trafficking by developing concrete recommendations and effective joint strategies. In recent years, the focus has been on child trafficking, trafficking for forced criminality and human trafficking along migration routes. Responding to the 18th Alliance against Trafficking call for an inclusive, multi-disciplinary and multi-agency approach specifically and to the need for innovative, multi-stakeholder initiatives in the fight against trafficking in general, RESPECT and its upcoming projects, tailored to the private sector’s needs and circumstances, have come into existence. Furthermore, Livia Wagner, the RESPECT Coordinator from the Global Initiative against Transnational Organized Crime, presented RESPECT, our Survey Results on the Private Sector Needs (which reached out to +10,000 companies last year), and our upcoming project on creating an “Interactive Map for Business of Human Trafficking Organisations” at the OSCE’s 18th Alliance against Trafficking. The “Interactive Map for Business of Human Trafficking Organisations” project is co-organised by the United Nations Global Compact and the Global Business Coalition Against Trafficking, as well as supported by Business for Social Responsibility, the International Labour Organization and Alliance 8.7 and will be hosted on http://www.modernslaverymap.com/ (upcoming).